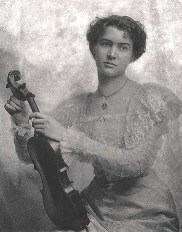 Leonora Jackson (Leonora Jackson McKim) was an American violinist born (in Boston, USA) on February 20, 1879 (Brahms was about 46 years old.) One source gives the year of her birth as 1880. She concertized at a time when female concert violinists were a rarity. Although she lived a long life, she is almost completely forgotten today. As did many artists before her, she received financial support from a benevolent patron to enable her to study in well-known conservatories. In her case, the patron was none other than Frances Cleveland, wife of U.S. President Grover Cleveland (1837-1908.) Another of her well-known patrons was George Vanderbilt. The schools she attended were in Chicago, Paris, and Berlin. I have no idea who she studied with in Chicago but I do know she won the well-regarded Mendelssohn Stipendium (Mendelssohn Scholarship) in October of 1897, the first American to do so. The award consisted of about $90,000 in today’s dollars and was intended to assist foreign students to attend the Leipzig Conservatory. For obvious reasons, it was discontinued in 1934 but later re-established. Subsequent winners of this prize have included Ernst Toch, Kurt Weill, Max Rostal, and Roman Totenberg (Nina’s father.) In Berlin, she studied with Joseph Joachim. Her debut is said to have taken place in 1896. Jackson often played for European royalty and was also decorated by Queen Victoria of England. She performed with the top orchestras of Europe and the U.S., including those of Boston and London. Her career was so successful that in the 1900-1901 season, she played over 160 concerts in the U.S. alone. Nonetheless, on February 22, 1900, she played the Mendelssohn concerto in New York (with the Boston Symphony) and received a very unfavorable review. Her retirement came in 1915, at age 36, after her marriage to William McKim (1855-1935.) As far as I know, she never recorded anything; however, a well-known Stradivarius violin (1714) bears her name and is now owned by William Sloan of Los Angeles. She sold it four years after her marriage. The violin had been previously owned by Hungarian violinist Joseph Joachim - one of her teachers. Leonora Jackson died on January 7, 1969, at age 89, in complete obscurity.